There are 10 posts in this thread, and it has been viewed 13803 times. 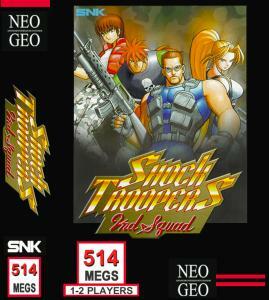 Is Shock Troopers: 2nd Squad any good? Shock Troopers: 2nd Squad is the follow up game to Shock Troopers, which is considered by many to be just as good as the Metal Slug series. Come join the discussion thread! 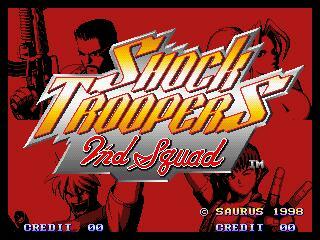 Shock Troopers: 2nd Squad is the second game after Shock Troopers. It is considered to be a standalone title since the plot has no connection with the first game. The gameplay system has been drastically changed because only 4 characters are selectable and the team mode from the first game is not featured in this. Also, the graphics has a more cartoon-feel to it and the sprites are a combination of 2D and 3D, although the game is completely in 2D since the 3D graphics are pre-rendered. There is also the ability to ride some vehicles, as in the Metal Slug games. A third title in the series, Shock Troopers 3, was also planned but never released. A good game, but as many would agree, not as good as the first. The first Shock Troopers was absolutely great. This one has less of a roster, less levels less weapons versatility. 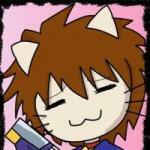 One think I do like is the cutesy pseudo-3d graphics. A great game, I plan to add this one to my MVS collection in the near future. Awesome soundtrack, by the way. 2nd Squad is kinda good, but it agree with 2D, the 1st S.T. had most of the good stuff that the 2nd one didn't have, but at least it introduced vehicles just like in Metal Slug, Soundtrack is kinda so-so then the 1st, but overall, good game. The game is okay to start with. The vehicles do make it Metal Slug like, except that the vehicles don't have as many rotational cannon angles as the slugs and cannot jump like the slugs, however the charging of a cannon on a vehicle is something new and the Mech Suit is incredible. Also there is more stuff to destroy. 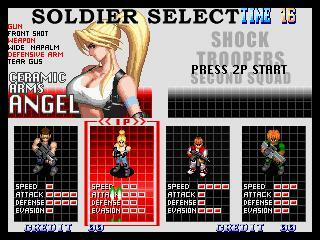 Angel is a particular favourite Shock Trooper of mine after Milky, Jackal and Marie Bee. It shouldn't surprise anyone that the first shock troopers never make an appearance in this game. There however various setbacks to the game. I don't particularly like Toy and Lulu, they're mess ups on both weapon choice and status. The weapon variety is pretty short and you get more powerups than types. The DIC soldiers make stupid "Oh!" noises when shot as opposed to the realistic screams of the BSG terrorists in the prequel. The plotline of the game isn't very good, due to the name Billberk and that all DIC plans to do is launch their nuclear weapons on town. Who calls a town Billberk? I wonder if the company name DIC is a mock up and a mash up of DiC Animations. Heh! Heh! Also the missions are too short and not enough of them and there are two paths instead of three. Out of all the missions I like to play through is the railway line. It's just like the Metal Slug 2 train. Finally the music does not have that cool heavy metal tune Shock Troopers 1 has. I cannot deny that Shock Troopers 1 beats 2, but this game is just for extras and to see something new and experience the thrill of tanks and mechs. This is more like it back to NG games at last. I am fortunate to own this game in a MVS shockbox and it looks great in my games room. The game itself is very good but is forever destined to live in its prequels shadow ( does anyone prefer this over the original very doubtful) as it is simply not as good in every department. Still its a decent game that is well worth getting as its usually under �50 for MVS so worth owning. The slowdown and the final boss do kinda take the shine off it and I cant help thinking with a little extra care/time it could have been something really special. But its a fun shooter with cool graphics , a shame the series never became a trilogy as I am a fan of both games . Like I wrote this morning; The Shock troopers II HSC would be up by night time...And what do you know...It really is!!!!! I updated the main post with the link. Great game but I have to agree with everyone that the first game is better overall. The graphics in 2nd Squad look good but I prefer the graphical style of the first game. The first game also had more different stages too. I don't mind the omission of the team mode though because I always play in lone wolf mode anyway. What's really good about 2nd Squad is the addition of the vehicles which are fun to use and add a bit of variety. Also the soundtrack is excellent and I think I prefer it slightly over the music in the first game. This probably won't come as a surprise but the slowdown doesn't bother me in the slightest. I'm sure most of you already know about this but there's also a hacked version of 2nd Squad called Lansquenet 2004. It changes the order of the stages, you always have access to all the weapons, enemy hits do less damage, the high score screen music is playing during the intro and the slowdown is reduced. This hack makes the game extremely easy. I completely agree with you guys, it's fun to play but the prequel is much better in every way. 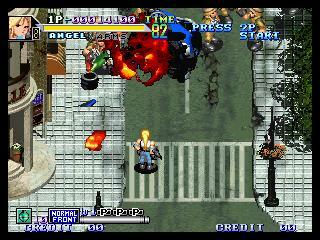 What annoys me most is that there aren't much alternative routes as in Shock Troopers 1. I don't know if Saurus really was motivated to create a worth sequel or not; I just know for sure it isn't, even if it has some entertaining moments. And why Saurus couldn't add at least one known character from ST1 to 2nd Squad? 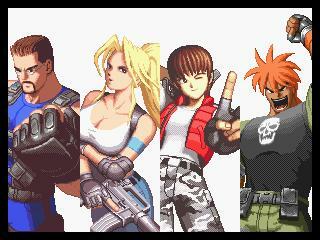 The chars back then were awesome (do you remember for example Big Mama?). It's just a pity that at the end we "only" got a half-good Run&Gun game with slowdowns. But maybe it just is an impression I have just because Shock Troopers 1 was sooo good (and really hard to top). Now you come to mention it, I actually do miss the previous Shock Troopers. The evasive jump never beats the evasive roll. No way could I forget Big Mama, she reminds me Mammy Two Shoes from the classic Tom & Jerry cartoons.